You may probably notice that I haven’t been updating Web Designer Wall for a while. I’ve been working very hard on a new project called Themify, a premium WordPress theme shop. It is a collaboration with Darcy Clarke, who is an amazing developer. Each theme is packed a framework and bunch of custom widgets. 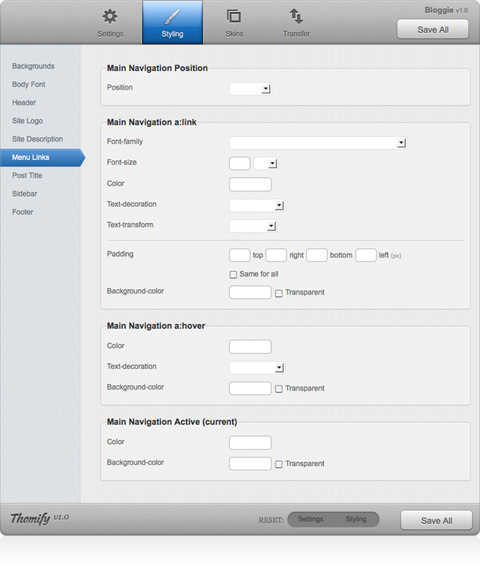 With the framework, you can apply theme settings, style everything, apply skins, and import/export the setting data. Let me know what your thoughts. Also, don’t forget to follow us on Twitter @themify. Looks very promising, good work! Looks like some excellent themes in there, really nice designs and it seems as though you have integrated some excellent options with the themes. Couple of questions. Are the themes GPL? Is there a price to download all themes but without the monthly fee? I was noticing :( But I knew you had to have something up your sleeve. This stuff looks really really rad!!! Great job! @Robbi – will consider it. @Mark – Yes, they are GPL licensed (http://themify.me/terms). You can signup the theme club and cancel within the first month. I’ve been eying up and experimenting with woothemes ….they have lots of fancy ones but this stuff looks really slick. I really like the “Blogfolio” theme! Useful for graphic designers with no web skills. Nice! Keep it up, will be nice when theres alot of themes on there. Will you only be producing themes between you or will you be offering a commision type system to other designers as well? @Hannes – the post image is optional. They work with or without any image. There are also options in the framework to set image size & alignment, etc. @Matthew – At the moment, we are designing the themes in house. But eventually we will outsource or offer commission type system as you mentioned. dude, you might want to stop that slideshow on the homepage on hover. that’s super annoying, it’s set to give you just enough time to read the content but not get a really good look on the imagery. Those themes cost so much! Please consider lowering your prices for the sake of this bad economy. Awesome work as usual. I currently use Thesis for my site but I will definitely give “Blogfolio” a try for a future project, I love it. I really don’t like the tone of this article – it really sounds like you’re taking your audience for granted. You’ve lost one subscriber here. Looks like they have some pretty cool premium themes, glad to see them join the wordpress party! This is going to be the next da-bomb successful project of yours. I’ve seen most of it. Really full of ideas. Liked it. Bookmarked. Looks really impressive! The custom widgets seems like a really nice bonus! I really like this, the themes are awesome, including the one on this very page. Having purchased a theme I am very impressed. Very customisable and really good quality. Custom widgets is a real bonus, and the skinning functionality makes creating different variants a breeze. Nice work! Great, as a big user of themeforrest and getting into developing WP themes this is great. Thanks! Very nice themes. I really like the way you include art on the themes. Good luck and congratulations. I wish you well with the site! Very Nice, I love this theme, thanks for share! Congrats on the launch. It’s looking great! Very nice ! Much luck with this project ! Future Free online Game PlayStation. where you can play future games totally free…..
i am sure you never see before.. .
Great idea. As a user of many themes, both paid and free, I would love to see a collection of themes that used the same or very similar administrative pages. This is a constant issue that I wrestle with, as often learning each new theme takes half of a day. Even when I get them from the same company they are written by different people and aren’t based on a template of some sort. This is just a wish list. This tool is very helpful… thanks for sharing it to us..
i just came back to say thanks for the theme, i really love it.. Very interesting post. Thanks for sharing this post with us. Very helpful, can’t wait to utilize this. great tool.. really helped me a lot.. I like a lot the bizco theme! Good luck with your new project! I like bizco theme! Good luck with your new project! Very important points are there for making design more user friendly. Many thanks for themes. Really helpful in theme creation.It help me a lot. As you already know the difference between the cameras in these phones is quite big but it was interesting to find out just how big using white iphone 4 and iphone 3. Check out the shootout gallery inside. I do not know if that’s accurate, but hey, it’s your blog! I observe this project and i will visit your website again later. Thank you for your sharing here. Lens, in his statement, in advance by expressing a variety of symptoms anlaşılabildiğini, routine checks should be done in order to prevent fatal heart attack stressed. that’s cool and neat dashboard, i should download one of your templates and install it on my new wp blog :) thanks for the design. One of the best things that were done in Worpdress world !! This product really worked wonders for me! You should definitely click on my name, read my review, then try it yourself! Hope you like it as much as I did. Byeeee! Lots of love, Tammy. I agree that it is protective to not want to run in hot temps, to react physiologically with anxiety, fear, and irritation. But at the same time, the mind allows us to assess the situation and make decisions as opposed to succumbing to what the body tells us. If we gave in to this physiological mechanism, wed never run a marathon. We follow and use many – The selection of themes have proven very useful.